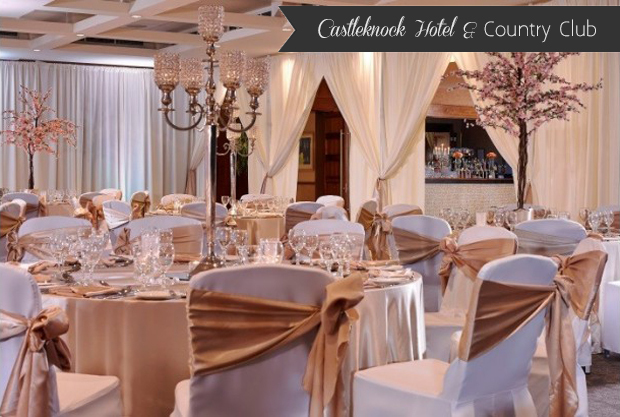 The award winning Castleknock Hotel & Country Club in Dublin is close to the Strawberry Beds and Phoenix Park if you’re after a gorgeous backdrop for photos. This chic and contemporary hotel is renowned for its excellent service and amazing food and couples can take their pick of packages or tailor make their own. The stunning ballroom comes complete with mood lighting and has several setup options. It also boasts two main bars and an adjacent smoking terrace. If you want to tie the knot on site, you can do so in their stunning suite with first floor balcony which has idyllic views of the surrounding countryside. 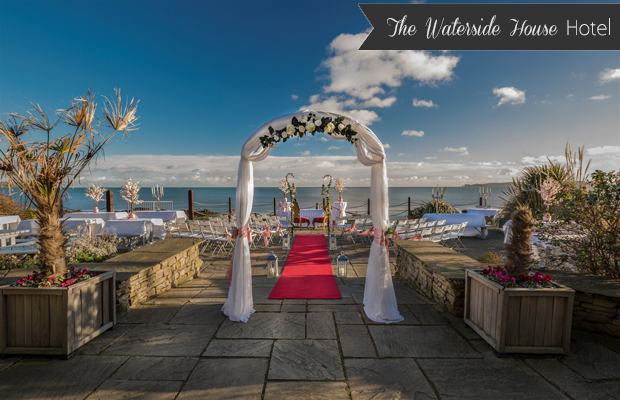 If you’re dreaming a of a beach side venue, The Waterside House Hotel in Donabate might tick all your boxes. The Waterside House Hotel sits on Donabate Beach along the North County Dublin coastline and has spectacular views that are sure to impress guests. 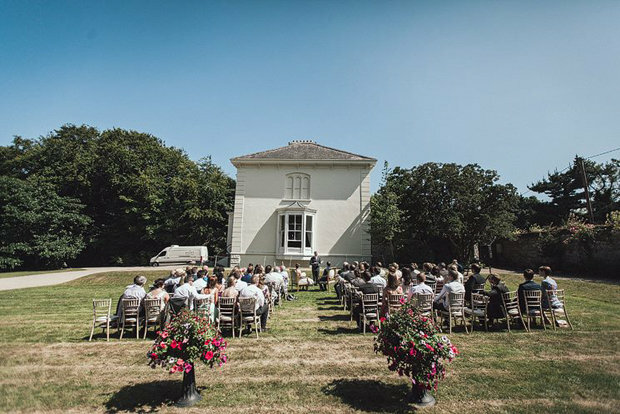 Their Martello Ballroom can cater for up to 160 people and their Lambay Suite and Samphire Restaurant are perfect for more intimate weddings. Couples can kick-start their celebrations on the Sea View Terrace, basking in the sea breeze and gorgeous ocean views in summer or cosying up indoors with a fire, watching the crashing waves come winter. They have a one wedding per day policy. 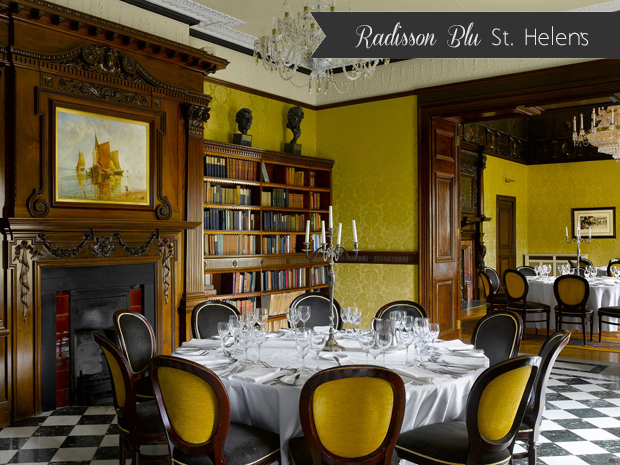 Set on 4 acres of private gardens, Radisson Blu St. Helen’s is an elegant and luxurious 18th century Irish mansion in a central Dublin location. The hotel can cater for as little as 10 people and up to larger parties of 270 guests with several beautiful dining suites available. The gorgeous grounds and its impressive historical architecture lend themselves to a beautiful backdrop for wedding photographs, while the hotel itself is luxuriously appointed creating a magical and romantic setting for your celebrations. They’re renowned for their excellent service and their dedicated wedding coordinator Zuzana Hasler will work with you every step of the way. 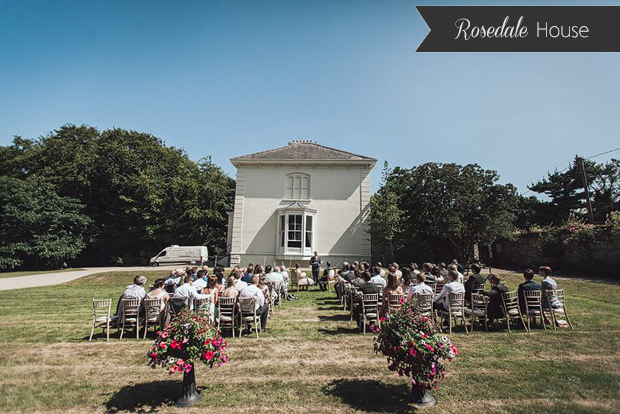 The charming Rosedale House is an exclusive wedding venue, neatly tucked away in south county Dublin, overlooking the Irish Sea. This majestic house, with ornate ceilings, sumptuous carpets, antique furnishings and sash windows overlooking the grounds, is set on a beautiful six acre estate with stunning formal gardens. 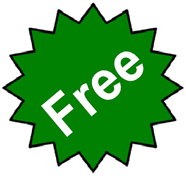 It can cater for both big and small weddings from 25 to 250 guests and weddings here are exclusive which means you have the whole place to yourself. Not only is it home to some seriously stylish themed rooms, it also has its own private nightclub and a purpose built marquee set in their walled garden, ideal for larger parties. The romantic Finnstown Castle Hotel offers couples an idyllic setting just 25 minutes from Dublin city centre. As you enter the gates and travel up the magnificent tree lined avenue, you’ll find a cosy and welcoming country house. The beautiful mature grounds surrounding the house are dotted with ancient trees, charming gazebos and ornamental three-tier fountains, providing ample photo opportunities. Inside is just as beautiful – guests can toast the happy couple in the cosy Library Suite before retiring to the magnificent chandelier adorned ballroom for a night of fine food and dancing. 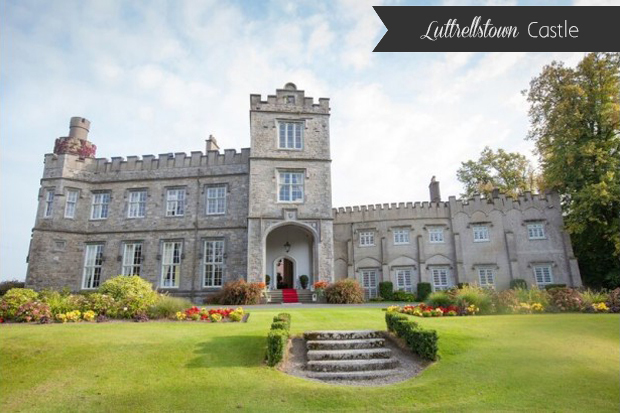 The luxurious Luttrellstown Castle can be your own stunning stately home for the night! Available for exclusive private rental, this stunning castle venue can accommodate up to 180 guests. Their beautiful grounds and majestic facade provide endless picture opportunities and the inside is just as impressive. The castle’s luxurious interiors have the wow factor from two magnificently appointed ballrooms to the charming library with its cosy, old world feel. Couples after a country house setting also have the option of The Clubhouse, designed in the style of a Swiss Alpine chalet with luxurious facilities and panoramic views over the Wicklow Mountains. Beaufield Mews is a hidden oasis just 4 miles from Dublin city centre. The 18th Century stables and courtyard have been lovingly restored and mixes old world charm with an alternative twist. Their beautiful walled rose gardens can be used for ceremonies and blessings or is the perfect place to kick off your drinks reception. Their menu offerings are as unique as the setting with lots of gourmet food options for couples looking to give their wedding menu a fun twist – hog roasts, barbeques, rustic picnics and the restaurant’s ‘Mini Feast’ menus are popular choices but their 5 course meal will also go down a treat if you’re after a more traditional menu. Nestled beside the National Library of Ireland on Dublin’s Kildare Street, No.6 has been the home of the Royal College of Physicians of Ireland since 1864. However, couples looking for an elegant and unique space in the heart of the city can now hire this landmark building for their wedding celebrations! 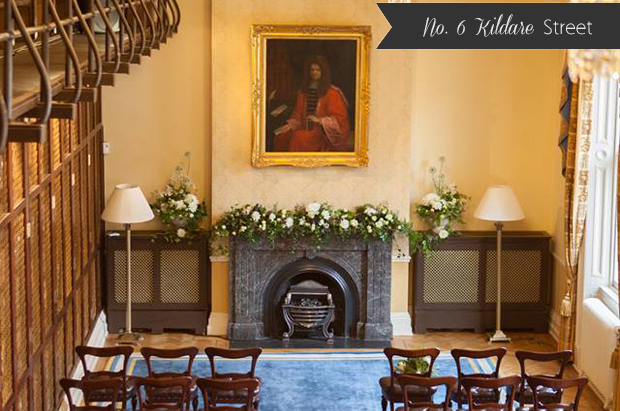 Thanks to its illustrious medical past, No.6 Kildare Street houses an eclectic collection of artifacts and antiques and has eight stylish rooms, each with its own distinctive character. It can accommodate up to 150 wedding guests and its central Dublin location ensure couples have lots of fab options for cool city photos. 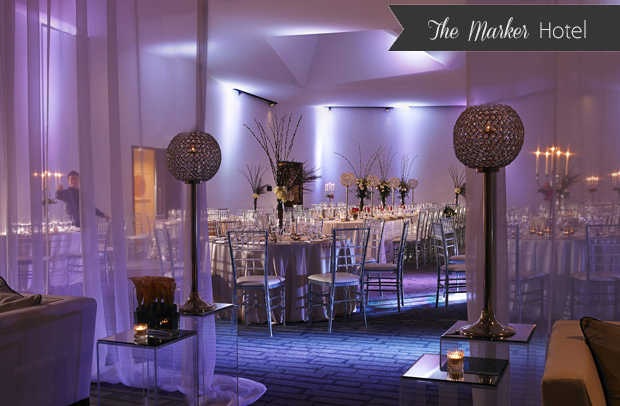 Located in Grand Canal, The Marker Hotel is perfect for couples after a modern space for their Big Day. Their Brasserie wedding package is suitable for up to 94 guests and is a dream for foodies with celebrations kicking off in the glam urban rooftop garden with incredible city views. Guests will then be treated to a 4 course tasting menu before retreating to the roof for a night of partying under the stars! If you’d like a larger bash, the striking Marker Suite can host 240 people and mirrors the Marker’s unique architectural features with awesome floating ceiling. Or if it’s an intimate dinner you’re after, they can arrange that too! 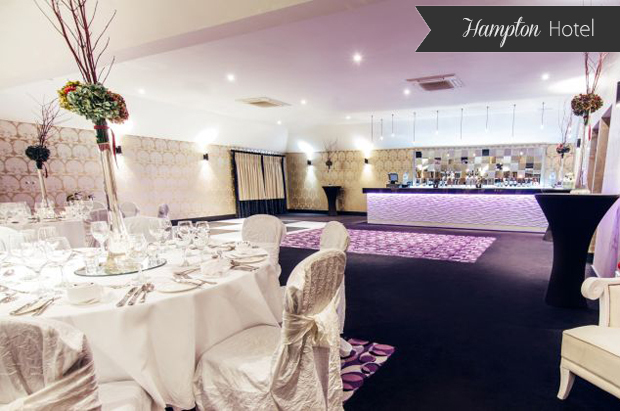 Hampton Hotel specialises in boutique, personalised events. Stylishly and creatively converted from six Georgian buildings, Hampton Hotel is located in the picturesque Donnybrook suburb offering couples a fab space, not far from the city centre. The timeless classic exterior reflects times past while inside the hotel is bursting with personality and style with funky, contemporary furniture. The striking Donnybrook Room can cater for up to 120 guests and the team will work with you to create a day as individual as you whether you’re after something low key or something cool or creative. 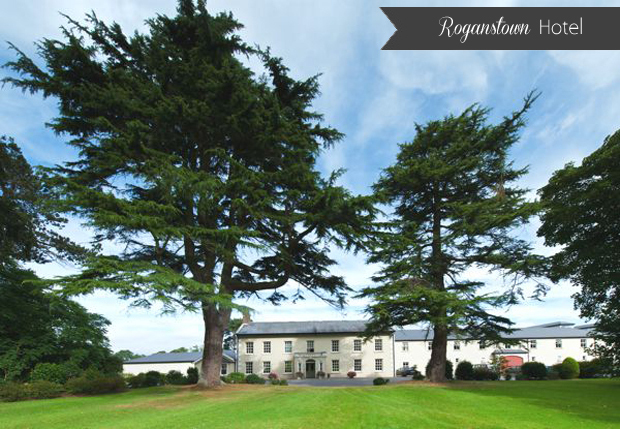 Roganstown Hotel & Country Club is a beautifully restored country house nestled in the Dublin countryside, just 20 minutes from the city centre. Roganstown‘s magnificent staircase leads to the stunning Aungier Suite, which can host up to 240 guests and boasts its own heated terrace and views over the golf course. The manicured lawns and Japanese Gardens provide beautiful photo opportunities and coupes looking to steal a few minutes to themselves will love being able to escape to the lake for a glass of bubbly – its also the perfect spot for some romantic snaps. They have a one wedding a day policy. 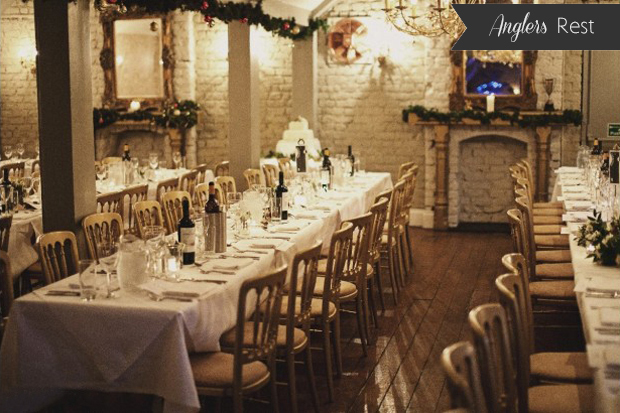 Its picturesque location on the banks of the River Liffey at the Strawberry Beds combined with its excellent reputation for fine food make the Angler’s Rest an ideal choice for couples looking for a charming wedding venue near the capital. The venue’s stylish decor will be a big hit with couples after a unique and cosy setting for their Big Day. The team works closely with couples to ensure each wedding is full of lovely details and personal touches. 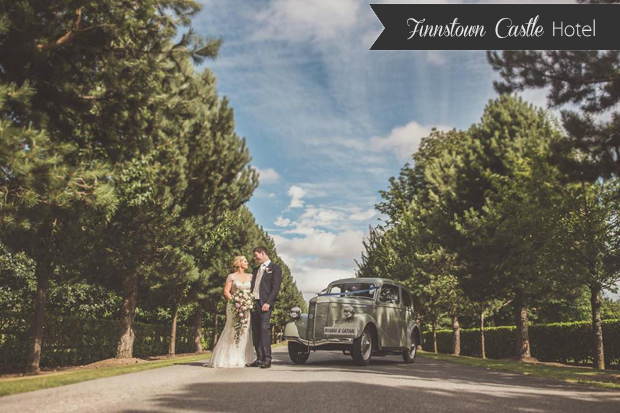 There are ample photo opportunities within the venue itself and the iconic Phoenix Park is just a stroll away as well. The 4* Carlton Hotel and Gardens, Blanchardstown is a contemporary hotel that combines Irish hospitality with an elegant setting. 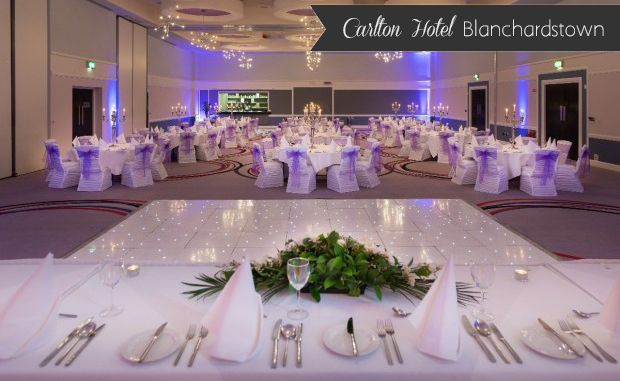 The Carlton Hotel Blanchardstown is conveniently located close to all major road systems and caters for both and large and small weddings whether you’re looking to host an intimate dinner party or a lavish bash in their magnificent ballroom for up to 350 guests. Whether you want traditional or something a little bit different, the dedicated wedding team will work with you, pulling out all the stops. 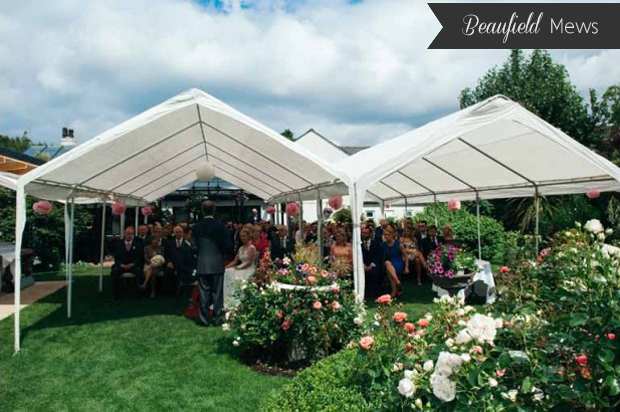 You won’t have to go far for gorgeous wedding photos either, their wedding garden is the ideal backdrop. 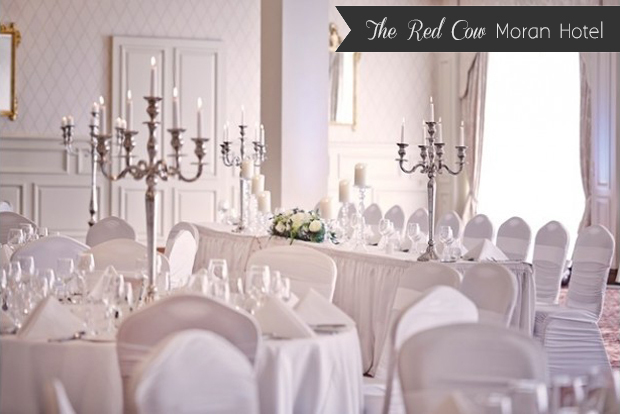 Couples can look forward to a red carpet arrival and warm welcome at the 4* Red Cow Moran Hotel. Their stunning ballroom is designed to hold up to 450 guests or if it’s a smaller affair, you have your pick of fab suites as well as the newly opened Tom’s Table Restaurant which is popular with couples after a sophisticated, contemporary setting. They offer complete packages to make your planning journey as easy as possible and pride themselves on always going the extra mile to make weddings truly unforgettable. Their sweeping staircase with Murano glass chandelier is a real feature point and is a stunning backdrop for photos.